The first upgraded Hawk-i to be displayed at Aero India 2017. 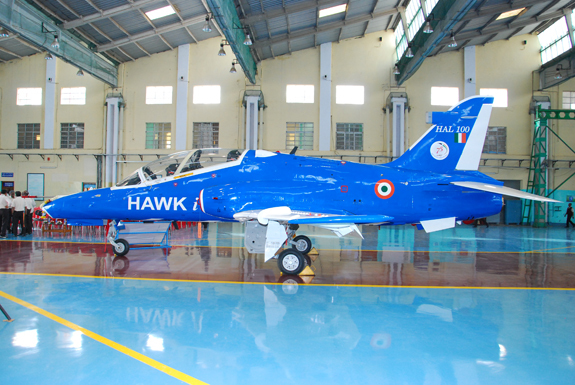 HAL, an indian aerospace company, has rolled out the first indigenously upgraded Hawk Mk132, named as Hawk-i on the eve of Republic Day celebrations. 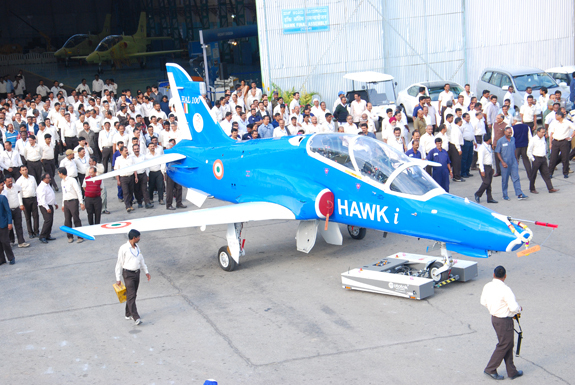 “This is the 100th Hawk aircraft produced at HAL and we are proud that it has Make in India mark. HAL had conceived a programme for indigenous upgradation of the Hawk Mk132 for achieving self-reliance and has successfully accomplished it”, says Mr. T. Suvarna Raju, CMD, HAL. This aircraft would be on the flying display in the forthcoming Aero-India 2017 at Bengaluru, he adds. The upgrade of HAWK Aircraft was taken up at HAL to so as to be independent in matters such as integration of new sub-systems or modifications, obsolescence management of avionics systems and to enhance the aircraft operational and training capabilities. HAL has rolled out its own aircraft with the upgrade features in a record time. In the Hawk upgradation programme, imported Mission Computer and Data Transfer Units have been substituted with HAL designed and developed systems. This indigenous Mission Computer in the dual redundant configuration has additional capabilities such as Digital Map Generation (DMG) which provides improved situational awareness. The Embedded Virtual Training System (EVTS) offers improved training capability over the existing system. The HAWK-i also provides secured voice communication and data link capability by integration of Softnet Radio and pilots can configure and select cockpit Human Machine Interface (HMI) for different aircraft platforms.